Once Session is over you need to find out exactly what the legislation that has passed means to you! AIF has created the New Laws Reference Guide to give just that, a concise summery of what the legislative action does for your bottom line. 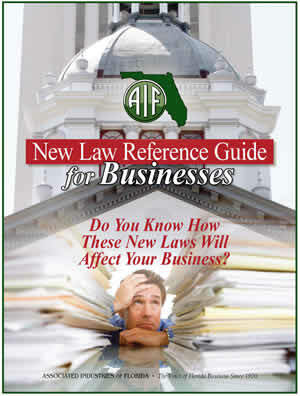 AIF's New Laws Brochures are available below in Adobe PDF format. You may also search AIF's extensive archives using the search function located in the menu bar. “AIF has been a consistent defender of Florida’s business community, taking tough positions and leading important initiatives that better our state and improve our economy.” Sonya R. Deen, Vice President, Government Relations JM Family Enterprises, Inc.